Julie from Joy's Hope (who I always want to call Joy because of her blog name or maybe because I am jealous of her families rainbow sneakers) posted these yummy treats that she calls puffs. They are a sugar cookie cups filled with a yummy creamy mixture and then topped with fruit. 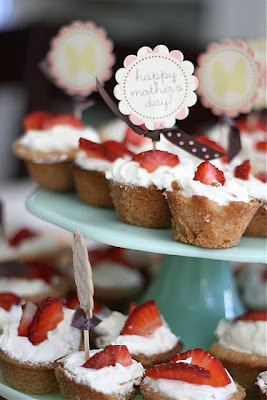 They would be great for Mother's Day or as an easy go to party dessert. And I am pretty sure that kids would love to make them too, so if you are looking for recipes to try out this summer, put this one on your list. You can get the recipe for these cute little treats HERE.